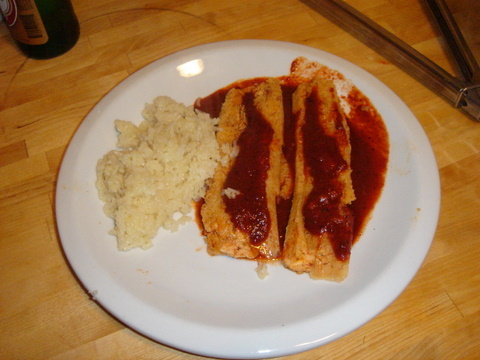 One of my favorite Mexican dishes has always been tamales even though they are so often poorly done when dining out. I fell in love with them in Phoenix about 15 years ago. At that time there were these fast food joints that specialized in tamales (I suppose they’re still there) — they were fantastic and cheap. 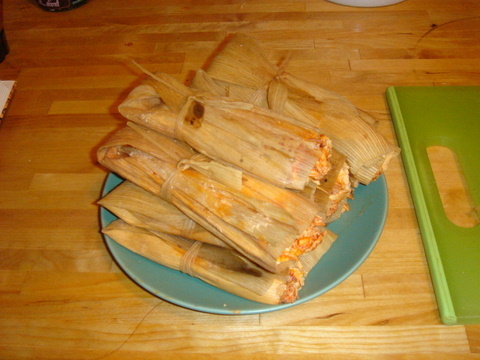 When I was a kid, my Mom bought tamales in a glass jar, seems awful now but they were quite a treat then. Of course, making them at home has always seemed a tad intimidating. Corn goodness surrounding a yummy filling; all wrapped up in a corn husk. Not exactly stuff you can get at your local supermarket. Unless, of course, if you live in a Mexican neighborhood. Which, as luck would have it, I do (along with Jamaicans, Pakistanis, and lots of other ethnicities). When I arrive home in Ditmas Park, Brooklyn each night, I pass a Mexican grocery and I always think that I must take advantage of this place and make something more than guacamole or tacos. 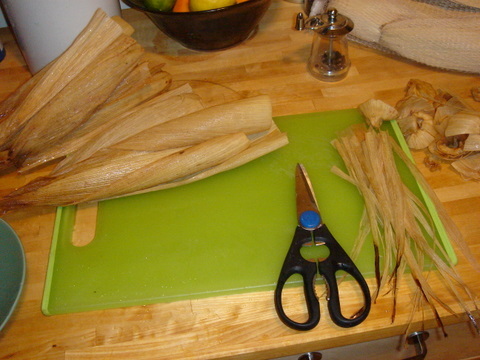 A long holiday weekend seems made for some cooking exploration, so I decided to try my hand at tamales. 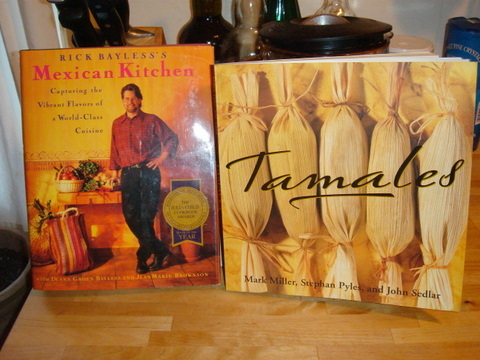 I have a tamale cookbook that Molly and I received as a gift and I also have a Rick Bayless cookbook. Between the two I figured I could find a simple chicken tamale recipe. Wrong. 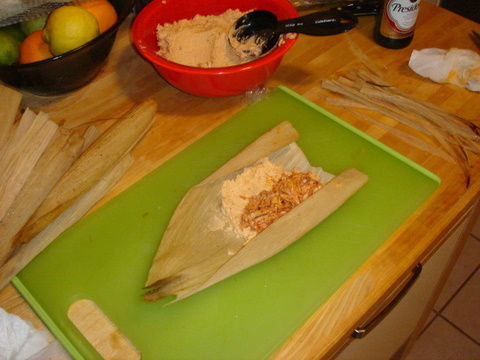 The tamale cookbook, cleverly name Tamales by Mark Miller and friends, is great but a bit fancy. And the Rick Bayless book, Mexican Kitchen, is a Mexican cooking tome inspired by his upscale Chicago restaurants. My simple chicken tamale recipe was not to be found in either. But I was able to get enough insight and a recipe for the masa dough and a sauce that I could wing the rest. First step was the shopping trip. 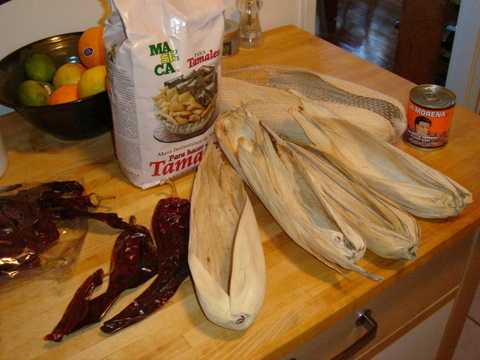 From my local Mexican market I picked up masa harina (corn meal made for tamales), chilpolte peppers in adobo sauce (this is common and can be found most anywhere), corn husks, and dried guajillo chiles. The masa harina was not labeled as such, but the clerk at the store assured me that I had the right stuff. I says “instant” on the package which usually means “crappy” but there didn’t seem to be any choice. Next was to get the corn husks to soaking in hot water. This makes them pliable so that they can be wrapped around the masa dough and filling. 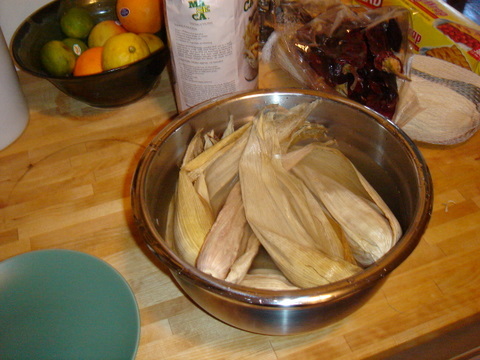 Fill a bowl with hot water and the corn husks and put a plate over the corn husks to keep them submerged. They stayed that way until I was ready to make the tamales (some 3 hours later). The books call for the masa dough to rest for an hour or two before filling, so it seemed logical to make that next. I used a recipe from the Tamales cookbook which sounded flavorful and seemed like it would go well with a chicken filling and a red chile sauce. 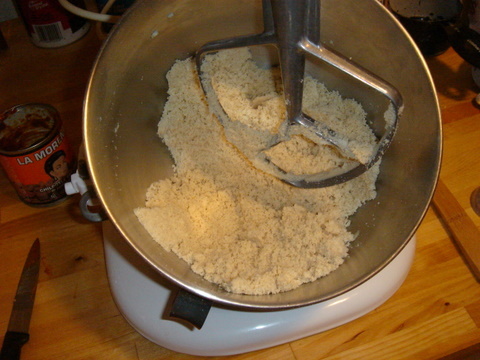 Combine the masa harina, salt and baking powder in a mixer bowl. Add butter and vegetable shortening and beat for 3 minutes. 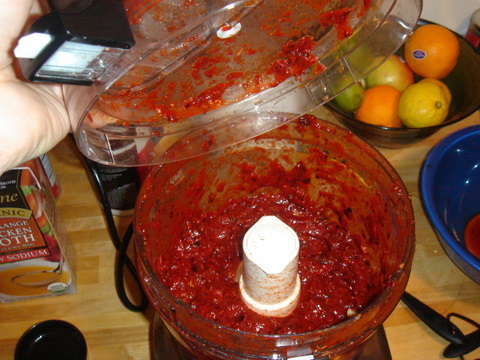 Put the can of chipoltes in blender and puree. 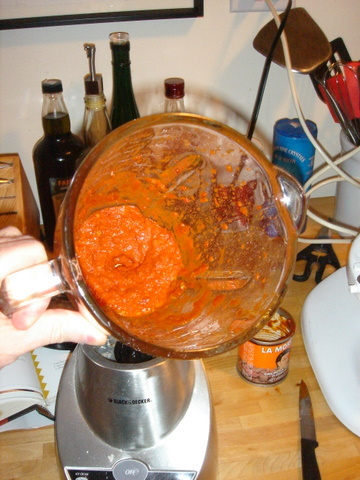 Add the water and 2 tablespoons of the pureed chipoltes to the masa harina mixture and mix for another 2 minutes. When well mixed, place the masa dough in a bowl, cover and set aside. The tamales are going to be filled with chicken. Simply stewed and mixed with a bit of the chile sauce seemed like a good bet. To cook the chicken, place two breasts (seasoned with salt and pepper) in a small pot with chicken stock. Boil for about 20 minutes and then remove from heat and let cool, in the broth. This will keep the chicken tender. This can be happening while the next step is undertaken. So far, pretty simple. But that’s about to change. 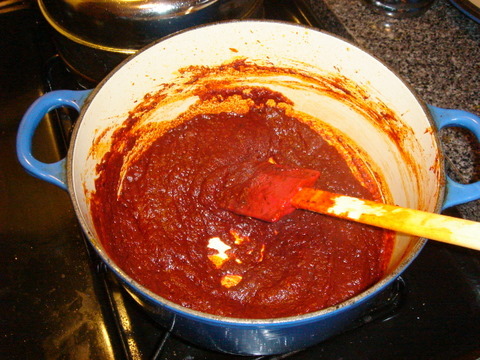 The sauce I chose was from the Rick Bayless cookbook. Heat a heavy skillet over medium heat. Toss in the unpeeled garlic and let roast for 15 minutes. Turn occasionally to keep from burning. When soft, remove from skins and chop roughly. 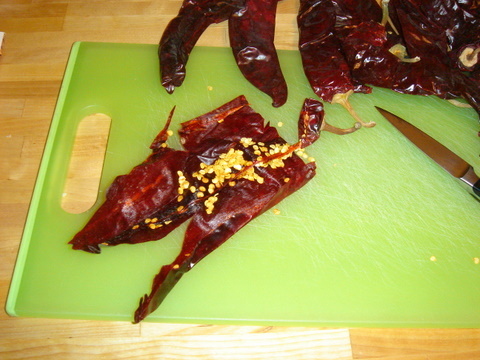 While the garlic is roasting, remove the stems, seeds and interior veins from the chiles. 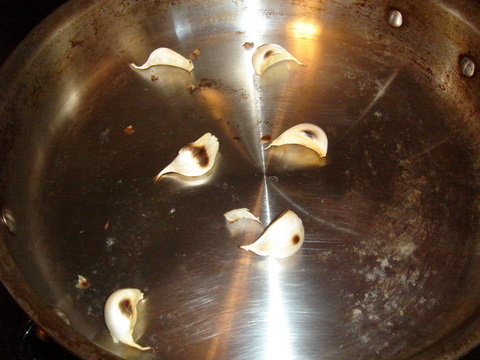 Toast the chiles in the same skillet you used for the garlic by placing the chiles interior side down and press with a spatula. They will crackle and may smoke, but that is ok. Do not let them burn, toast for maybe 15 seconds and then flip over and repeat on the other side. They will change color but don’t let them get too dark. Set aside in a bowl. 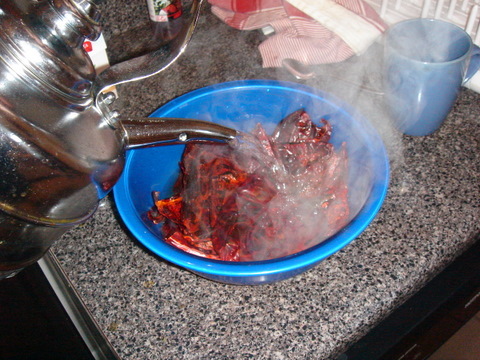 When all chiles have been toasted, fill bowl with hot water and let hydrate for 30 minutes. Stir regularly to ensure even soaking. Discard water when they are fully hydrated. You are probably starting to get the idea that this is not something that you’ll want to whip up after a long day at the office. I can see why I avoided making this up until now. At least I get to use lots of small appliances. Add the garlic, hydrated chiles, spices, and 2/3 cup of the chicken stock to the bowl of a food processor and process until smooth. After tasting it at this point, I felt it could use a little more kick so I added the remaining chipolte peppers left from the masa dough recipe. 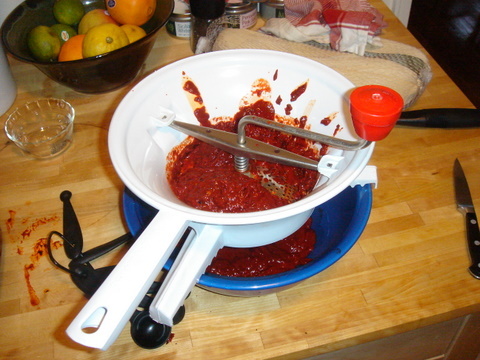 Once it as smooth as you can get it in the food process, run the puree through a food mill or strainer so that your are left with a very smooth puree. Heat the olive oil in a heavy 4 quart pot over medium-high heat. 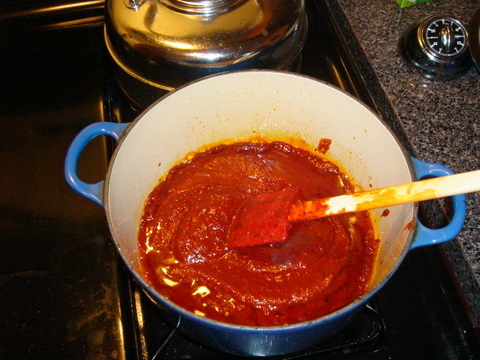 When the the oil is hot enough to cause a drop of the puree to sizzle, add the puree all at once. Cook, stirring constantly, as the puree sears, reduces, and darkens. 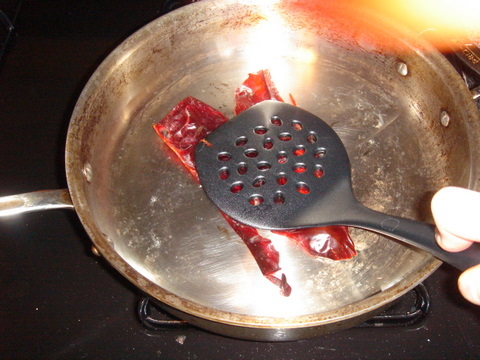 This process will cause the taste to smooth out and loose its raw chile edge. See the before and after photos. Add the remaining 3 cups of broth and simmer, partially covered for 30 minutes. Time to prepare the filling and make the tamales. Remove the chicken from the broth and shred with a fork. 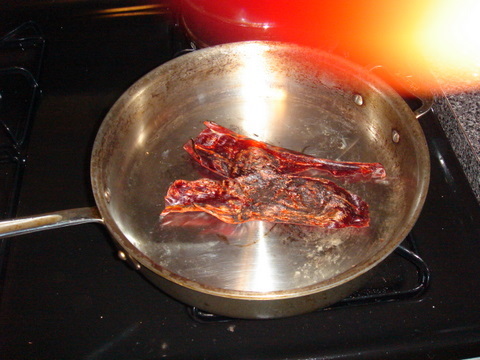 Place shredded chicken in a bowl and add a couple of spoonfuls of the guajillo sauce. Set aside. Remove the corn husks from the water. Cut off the bottom of each husk with scissors to square it off. One end should be square and the other should come to a point. Take a couple of husk and shred into long strips. Take one corn husk and wipe it dry with a paper towel. 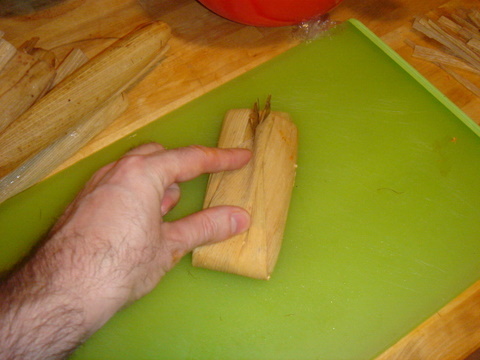 Take about 1/4 cup of the masa dough and place it about 3/4 inch from the square end. Spread it inside so that it is roughly rectangular running along the length of the husk. It should be about 3 x 5 inches or so. Take a bit of the chicken and place it down the center, lengthwise. 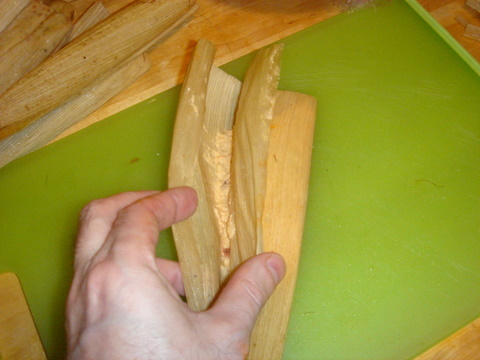 When folding, you do not want to get the husk inside the tamale, so carefully take both sides and bring them together so that the two sides of the masa dough touch, enclosing the chicken. 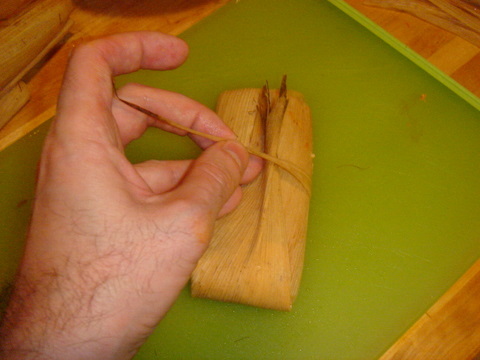 Fold the two sides of the husk down against the tamale and fold the pointed end up toward the center. Take a strip and tie together. One end of the tamales will be open. Hopefully the photos below make more sense than this description. 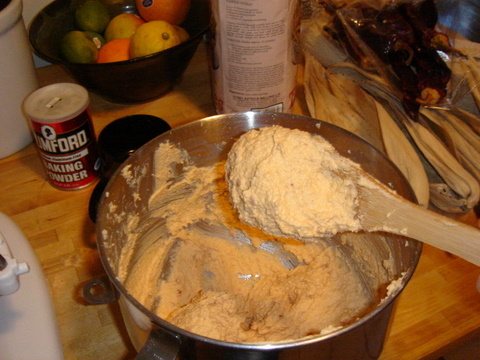 The masa dough recipe above and the two chicken breasts made ten tamales. All that remains is to steam them. Rick Bayless recommends placing them in the steamer on their ends, with the open end pointing up, but my steamer is too large for the quantity I made so I just put half in one basket and half in the other. I steamed them for about an hour, but they were probably done after 45 minutes. They are done when the masa dough is firm and separates easily from the corn husk. The dough will expand as it cooks and may come out the end. That is why it is a good idea to keep a little room from the edge when filling the husk. After all this effort, how did they taste? The photo doesn’t do it justice, but the tamales themselves were wonderful. The corn meal was light and fluffy, not heavy and dense like most that you get when eating in Mexican restaurants. The chipoltes in the masa dough added a lot of flavor, so that recipe is definitely a keeper. Not so sure about the guajillo chile sauce. It was good, but seems like a lot of effort for the payout. There is another chile sauce recipe from Saveur magazine that I have made in the past that is great and easier — I’ll have to dig that out. 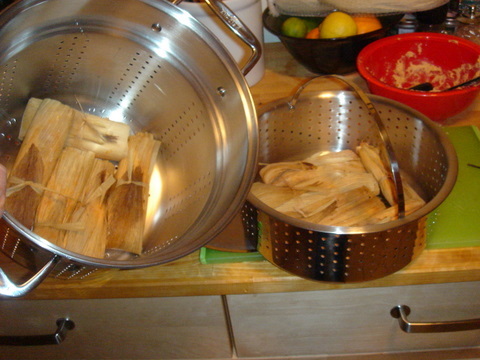 The good news is that once the tamales are steamed, they can be refrigerated or frozen and then resteamed. Supposedly they are just as good reheated. We will see. I hope so, because this is a lot of effort for one meal unless you are having a dinner party or making enough for several meals. You are currently browsing the archives for the *Craig category.